A graduation ceremony for 394 students was held by IE University today at its Santa Cruz la Real campus in Segovia, Spain. Some 54% (211) were men and 46% (183) were women, and they hailed from a total of 48 countries around the world. Two hundred and seven of the students were from IE University’s Bachelor in Business Administration, 20 were from the Bachelor in Architectural Studies, 21 from the Bachelor in Communication, 26 from the Bachelor of Laws, 15 from the Bachelor in Psychology, 44 from the Bachelor in International Relations, 52 from the Dual Degree in Business Administration and Laws, and 9 from the Dual Degree in Business Administration and International Relations. Floraleda Sacchi, one of the best known and most original harpists on the international stage, recently gave a recital in the old church of the Santa Cruz la Real Convent in Segovia, which today serves as the Aula Magna of IE University. The concert was organized by IE University Arts Society in collaboration with pianist and orchestra conductor Manuel Tevar, one of Spain’s most accomplished musicians, who has achieved a greater presence on the international arena than any of his Spanish peers. Sacchi played many of the pieces that have earned her international acclaim, including some from her latest album, #DARKLIGHT. They included soundtracks and contemporary music composed for and played on the electronic harp. Floraleda Sacchi is an exceptionally talented artist who has brought out over 20 albums, recorded and sold by major music companies. She has won sixteen prizes in international competitions and has performed in some of the greatest concert halls in the world, like Carnegie Hall and the United Nations Concert Hall in New York, Berlin’s Konzerthaus, and Kyoto’s Prefectural Hall. 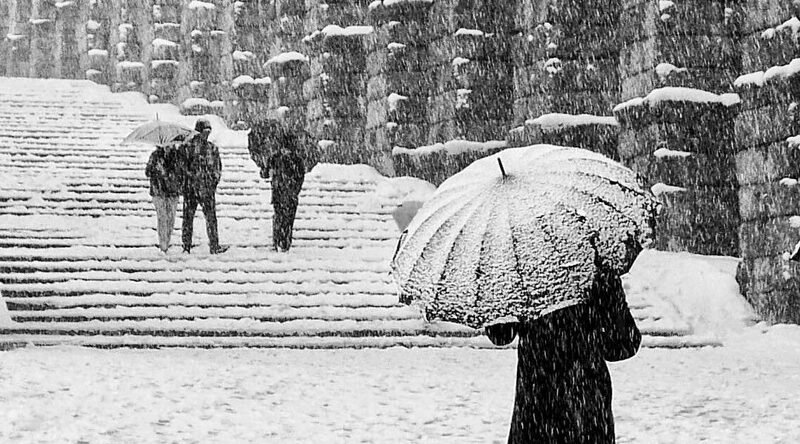 A snowstorm in the city center can bring the most wonderful gifts for a photographer, and you have to seize the opportunity when it presents itself. Today the snow has brought with it this image of two women dressed in traditional Segovian costumes looking not just highly unusual, but also kind of eerie and enigmatic. It strikes me as a scene from past times. Days marked by cold and inclement weather always serve up some kind of surprise. The deafening silence that accompanies a snowfall never ceases to surprise me. I feel privileged when I take an early morning walk through the deserted gardens scattered around my city, just after the last few snowflakes have fallen. I can’t help but wonder why the city takes so long to wake up on days like this. Passers-by walk the streets in silence, and the practically inaudible crunch of my feet on the soft, white snow jars the almost mystical aura of peace. At that moment I’m reminded of Saint John of the Cross, who prayed and rested here, and I totally understand his need for silence. Snow absorbs noise and invites a sense of calm, reflection, and inner peace. Today he would have been happy, just as I am now. Whenever it snows I try to go up to San Cebrián’s Gate, which forms part of Segovia’s city walls, to take photos of the landscape below. The gateway served to connect the city with the district of San Lorenzo and the old Dominican Convent which now houses the IE University campus. It’s impossible to survey Segovia from the highest point of any of the towers that make up its city walls and remain impassive. Architects Karen McEvoy (Ireland), Frank Barkow (Germany) and Stefano Boeri (Italy) were selected by IE University to take part in the latest edition of the Architectonic Integration Workshops organized by IE School of Architecture & Design. All three enjoy world renown for their commitment to architecture and their search for excellence in the field. Thus second and fourth-year students are able to work alongside them on campus and gain insights from three contemporary architects who set trends at an international level.